Lorna Cela joined LALIVE in 2017 as a trainee. Before joining the firm, Lorna Cela trained at the First Instance Court in Geneva on civil and commercial matters. Prior to this, she worked for a local bank and for a tax consulting firm. During her studies, she worked as an interpreter for the judicial police. 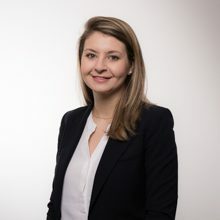 Lorna Cela holds a Bachelor and a Master of Laws (Economic Law), as well as a Certificate in Transnational Law (2015) from the University of Geneva. She also holds a Certificate of Advanced Studies in Legal Professions (2016) from the University of Geneva.